ClickDesk eliminates the entire hassle of installing any software as it is completely hosted on the cloud for fastest performance. Real time “calls” to the customer support agent are also made possible with ClickDesk. As it also comes with social platform integration such as twitter, linkedin and facebook of your business, customers get a 360degree live support which ultimately increases their loyalty and love for your brand or business. 1). Assist your Customers on the Go! ClickDesk on your website now and give the ability for your webvisitors to chat, talk or connect with your right on your website. Add the one-time friend requests you get from ClickDesk after setup to start responding to your website visitor chats on your instant messenger. 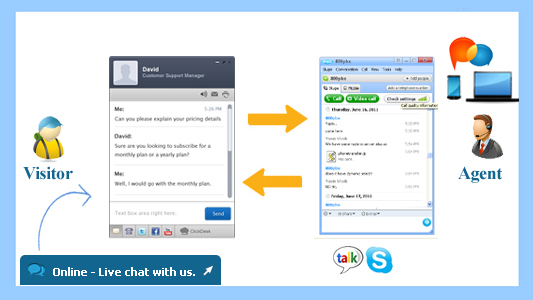 You can also give instant responses to the customer qeries through Skype from desktop, laptop or mobile. 2). Go Social. Go Global! ClickDesk social toolbar allows you to add your social network profile right to the clickdesk chat bar. This allows your visitors to connect with your brand on multiple social networking platforms without leaving your website. This not only connects your visitors and brand, but also saves good amount of realestate space on your website. ClickDesk social toolbar gives 360° brand promotion, interaction and customer satisfaction. Amit – nice review about ClickDesk. Glad you like it. Thanks for reading. Happy Holiday! 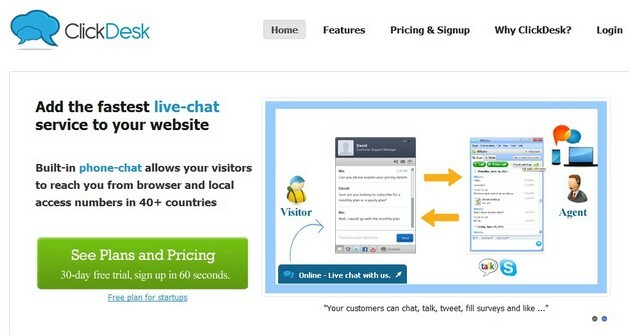 Brilliant product, best live-chat service around.